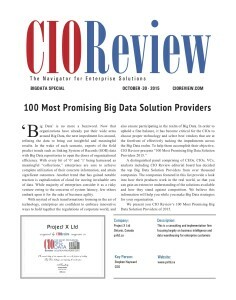 CIOReview (www.cioreview.com) has chosen Project X Ltd. (www.pxltd.ca) as one of its “100 Most Promising Big Data Solution Providers 2015” for system integration and advisory services to the enterprise marketplace. The selection is based on Project X Ltd.’s easy integration of geospatial functions into Google Maps to drive customer insight. 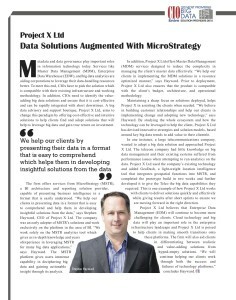 “Project X Ltd. is honored to be recognized by CIOReview’s panel of experts and thought leaders,” said Stephen Hayward, President, Project X Ltd.
Meaghan Davidson, Sales & Marketing Executive, Project X Ltd.
Project X Ltd. is a data and analytics boutique, systems integration and support firm in the information management space. We offer consulting services in advisory, data warehousing, data integration and business intelligence specifically through our MicroStrategy partnership. About Project X Labs Ltd.
By focusing on our clients’ objectives and best interests we are able to work collaboratively to drive business value from strategy through execution to delivery. Our rapid results methodology ensures our clients see wins along the course of projects with our time to value focus. Project X Ltd’s wholly owned subsidiary is Project X Labs Ltd. focused on product development around MicroStrategy. CIOReview constantly endeavors to identify “The Best” in a variety of areas important to tech business. Through nominations and consultations with industry leaders, our editors choose the best in different domains.